I got my members’ magazine from the Portland Art Museum last week and was intrigued by the photographs of work by Australian glass artist Klaus Moje. His work, including a four-panel work created especially for the exhibition will be at PAM starting May 31 and running to September 7. The thing that caught my eye was the similarities I saw to fiber works. Moje seems to be interested in pattern and juxtaposing one pattern against another. This is a detail from one of the Portland Panels. These works really seem to work with the concept of “piecing” . 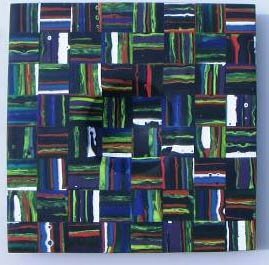 It suddenly occurred to me that there are other kinds of art that use many of the conventions and constructions that quilters and fiber artists use, including glass apparently and, of course, mosaic and collage work. Duh—obvious, I guess. I just hadn’t thought of it in that way before. I’m including this photo of Moje as well. Don’t know why I am always interested in seeing what an artist looks like. 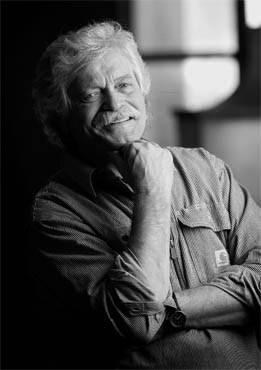 He looks like a cross between Kurt Vonnegut and Robert Redford, to me! Terry- Nice post about the glass/fiber connection. Also, folks may want to investigate this- Chihuly has done a whole long series where he is influenced by Native American rugs. The ones I have seen, limited I admit, are mostly straight sided vessels with small motifs marching up the sides but I was just as fascinated as you at the glass/fiber connection. Thanks for the post and the new (to me) artist. It’s time for another visit to the Art Museum, for sure. I, of course, have further questions, such as: what are all the similarities we can find between the Moje work, quilted art, and even Close and Stella. Some of these are the use of pattern, as Terry has stated, and juxtaposition of different patterns; rhythms that get set up across and within the work; scale within scale (I’m thinking of Close’s small abstracts that form his large images, or the Moje above and of course, pieced rectangles of low-water dyed fabrics), the use of geometric shapes to make patterns, and with glass and textiles, the use of texture and sculpting as integral to the whole. 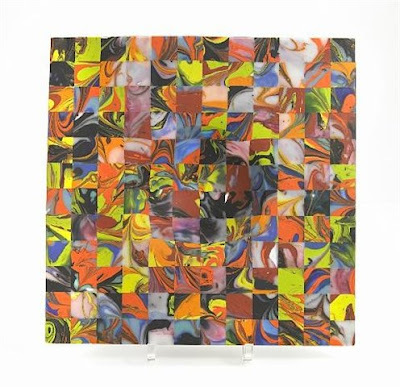 And the other question is what differences are there between the glass art, quilt art, and painted art — those arts that use these similar tactics of repetition, rhythm, pattern, juxtaposition of pattern, geometries, etc.? 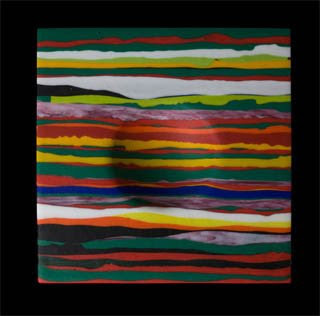 Some differences come immediately to mind — tactility of glass and textiles but not of paintings; 3 dimensionality of glass vs 2-d of painting and textile art; hard/soft/indifferent or simulated — these come to mind immediately and I’m sure there are many many others. 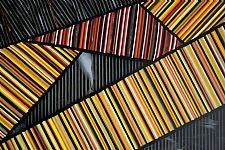 These aren’t frivolous questions — they are an attempt to define by description what textile art, paint-and-support art, and glass art have in common and where they differ. It’s one of my old bones, but I keep finding new ways to gnaw at it. I think of it as my end-run around the (tiresome and boring) question of craft vs. art. Seeing the Portland Art Museum, under a new director, exhibiting glass as one of its grandstand exhibits, makes me believe that description might be one way to stop the foolish distinctions and make more artistic ones. Am I stating the obvious when I see connections to piecing in Frank Stella’s or Chuck Close’s work too? OK, with Stella I actually see quilters influenced by him rather than him influenced by quilting (early Michael James?). But the repetitive “blocks” in Close’s work seems akin to quilt blocks to me.